Queue Manager shows user automated Tasks that are waiting for execution, being currently executed or recently completed. It provides user real-time overview and control over automated processed. Queue Manager allows user to immediately start queued Task or pause already running Task. Also the Task sequence can be changed. User may choose to remove the Task from the queue, if necessary. Queue Manager displays the list of Tasks, their completion rate and status as well as elapsed time since the Task has been started. User may click on the any Task to see more details such as Task name, path, status, time when it was queued, actually started and finished with accompanying details. Queue manager provides real-time information and management options for running tasks. Monitor automated Tasks ir real-time as they get queued, executed and completed. Start, pause or stop Tasks at any time. 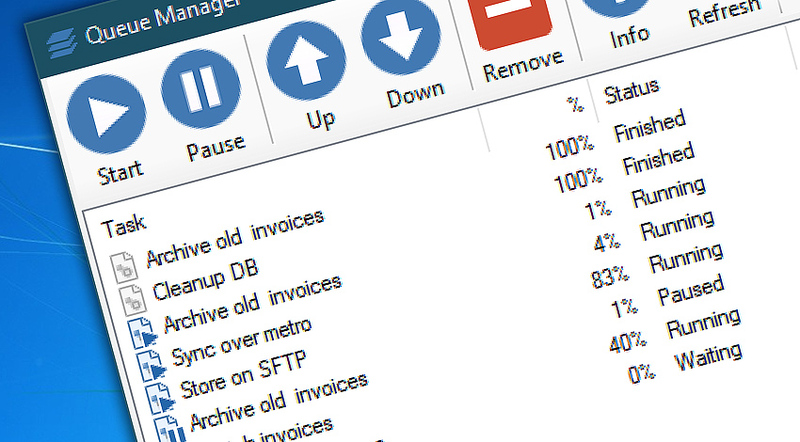 Manually move Tasks up or down in the queue, assigning them higher or lower priority. Get more detailed information on any running, finished and queued Tasks. Set the maximum number of simultaneously running Tasks. Queue Manager · on managing current Tasks. Toolbar · start, pause, stop Tasks or change their order. Tasks pane · shows Task, completion status, running time. Status bar · shows relevant Task statistics. I'm very happy with Automation Workshop. It increased my productivity by tenfold! —Charles J.